The University of New Brunswick’s Fredericton campus is a little brighter thanks to a new rainbow crosswalk. The crosswalk is the result of a bi-campus effort between the UNB Student Union and the St. Thomas University Students’ Union to increase the visibility and prominence of the LGBTQ+ community on campus. Painted in advance of Pride Week in Fredericton, it is in a high traffic area in front of UNB’s Student Union Building. Benjamin Palmer, UNBSU vice-president student life, says the rainbow crosswalk was painted in response to a need voiced by students. But as those crossing over the rainbow might notice, this particular crosswalk looks slightly different. 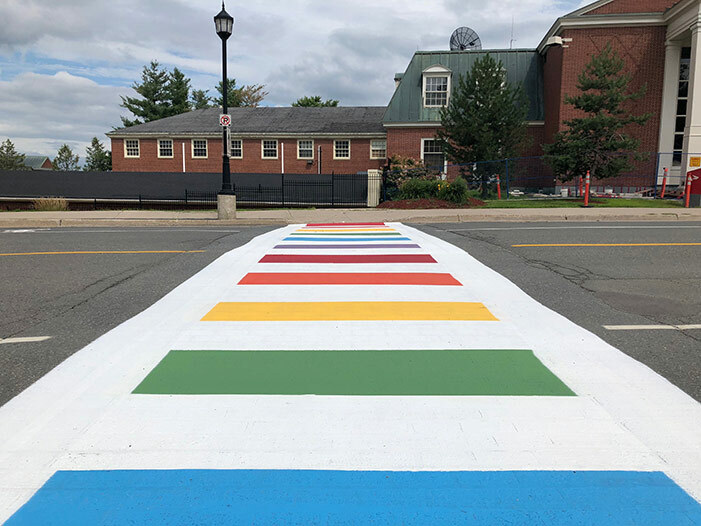 The Pride colours don’t replace the white crossing lines, but are instead painted in between them – the result of a series of consultations with community partners and advocacy groups including the Canadian National Institute for the Blind and UNB’s Student Accessibility Centre. The rainbow crosswalk follows one painted on UNB’s Saint John campus earlier this summer. It will be a permanent feature on the Fredericton campus, with the university committing to ongoing maintenance and upkeep. The UNBSU says this is just the first of many initiatives around equity, diversity and inclusion that they have planned for the year, including a new Breaking Stereotypes campaign and a push to have students’ voices heard in the upcoming provincial election. For now, they are hopeful that a small change in the university’s infrastructure will have a big impact. “My hope would be that a new student might come onto campus, and this might be the turning point where they realize that this is a community that is supportive and inclusive. That being able to see themselves reflected on campus could make a difference,” Mr. Palmer says.